During the 4th to 13th centuries there was a unique culture on the coast of contemporary Vietnam, owing its spiritual origins to the Hinduism of India. This is graphically illustrated by the remains of a series of impressive tower temples in a dramatic site that was the religious and political capital of the Champa Kingdom for most of its existence. My Son Sanctuary dates from the 4th to the 13th centuries CE. The property is located in the mountainous border Duy Xuyen District of Quang Nam Province, in central Viet Nam. It is situated within an elevated geological basin surrounded by a ring of mountains, which provides the watershed for the sacred Thu Bon river. The source of the Thu Bon river is here and it flows past the monuments, out of the basin, and through the historic heartland of the Champa Kingdom, draining into the South China Sea at its mouth near the ancient port city of Hoi An. The location gives the sites its strategic significance as it is also easily defensible. The tower temples were constructed over ten centuries of continuous development in what was the heart of the ancestral homeland of the ruling Dua Clan which unified the Cham clans and established the kingdom of Champapura (Sanskrit for City of the Cham people) in 192 CE. During the 4th to 13th centuries CE this unique culture, on the coast of contemporary Viet Nam, owed its spiritual origins to the Hinduism of the Indian sub-continent. Under this influence many temples were built to the Hindu divinities such as Krishna and Vishnu, but above all Shiva. Although Mahayan Buddhist penetrated the Cham culture, probably from the 4thcentury CE, and became strongly established in the north of the kingdom, Shivite Hinduism remained the established state religion. The monuments of the My Son sanctuary are the most important constructions of the My Son civilization. The tower temples have a variety of architectural designs symbolizing the greatness and purity of Mount Meru, the mythical sacred mountain home of Hindu gods at the center of the universe, now symbolically reproduced on Earth in the mountainous homeland of the Cham people. They are constructed in fired brick with stone pillars and decorated with sandstone bas-reliefs depicting scenes from Hindu mythology. Their technological sophistication is evidence of Cham engineering skills while the elaborate iconography and symbolism of the tower-temples give insight into the content and evolution of Cham religious and political thought. The monuments are unique and without equal in Southeast Asia. Criterion (ii): The My Son Sanctuary is an exceptional example of cultural interchange, with an indigenous society adapting to external cultural influences, notably the Hindu art and architecture of the Indian sub-continent. Criterion (iii): The Champa Kingdom was an important phenomenon in the political and cultural history of South – East Asia, vividly illustrated by the ruins of My Son. The Hindu tower temples of the My Son Sanctuary are located within a well-protected property with clearly defined boundaries. Eight groups of 71 standing monuments exist as well as extensive buried archaeology representing the complete historic sequence of construction of tower temples at the site, covering the entire period of the existence of the Champa Kingdom. Conservation of the My Son monuments began in the early part of the 20th century CE soon after their discovery in modern times by French archaeologists. During World War II, the First Indo-China War and, especially, during the Second Indo-China War, many tower temples were damaged. However, conservation work has been carried out and the remaining tower temples have been maintained and are well-preserved. The site is at risk from severe climatic conditions such as flooding and high humidity, though stream widening and clearance of surrounding vegetation have minimized these impacts. There remains an enduring issue of the possible presence of unidentified, unexploded ordnance within the boundaries of the property’s buffer zone, which has affected the archaeological research of newly-discovered areas, restoration of eight monumental areas, as well as site presentation for visitors. Our understanding of the authenticity of the My Son Sanctuary is underpinned by the work of Henry Parmentier in the early 20th century. Historically, investigation by archaeologists, historians, and other scholars in the 19th and early 20th century has recorded the significance of the site through its monuments, which are masterpieces of brick construction of the period, both in terms of the technology of their construction and because of their intricate carved-brick decorations. The location and the sacred nature of the site ensured that the monuments have remained intact within their original natural setting, although many have suffered some damage over the years. Conservation interventions under French and Polish expert guidance have been relatively minor and do not affect the overall level of authenticity of the site. The authenticity of My Son in terms of design, materials, workmanship, and setting continues to support it Outstanding Universal Value. The property was recognized as a National Site in 1979 by the Culture Ministry and as a Special National site in 2009 by the national government. All local and national authorities must act according to the provisions of the Cultural Heritage Law (2001 amended 2009). Overall responsibility for the protection of the property rests with the Ministry of Culture, Sports and Tourism, operating through its Department of Preservation and Museology. This responsibility is devolved to the Quang Nam Provincial Department of Culture, Sport and Tourism which collaborates closely with the People’s Committee of Duy Xuyen District, which has established My Son Management Board of Relics and Tourism. Account is taken of the special needs of the historic heritage in the Nation Plan for the Development of Tourism and in the General Plan for the Socio – Economic Development of Duy Xuyen District. A strategy for the revision of the Conservation Master plan of My Son is being developed as part of the current UNESCO Asia- Pacific World Heritage site project for My Son, and should be integrated within an up to date Management Plan for the site. 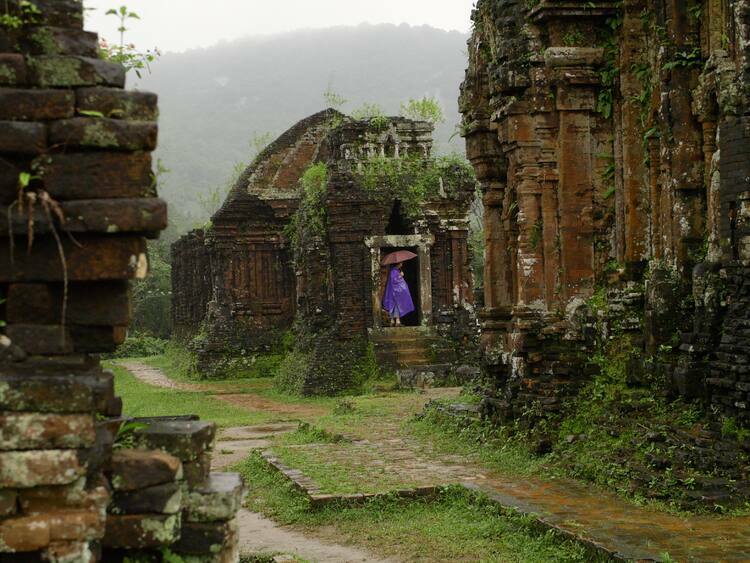 After the unification of Viet Nam in 1975, conservation work began again in earnest and now the conservation of the property is of a high standard with both national and international teams working on site. Although the Vietnamese authorities demined unexploded ordnance at four main monuments since 1975, this is progressing slowly and much de-mining work remains to be carried out. To further the safeguarding of the property, the Prime-Minister of Viet Nam promulgated Decision 1915/ QĐ-TTg, which gave formal approval and provided budgetary support for the property’s Master Plan (2008 to 2020) for the conservation and tourism promotion of the property. The management of the forested areas surrounding the site needs to be improved to allow better environmental protection of the property. Detailed monitoring of these areas for the effects of extreme climatic conditions should continue to be addressed, and should be included in the future long-term management of the property. With significantly increased numbers of tourists visiting the site, managing its carrying–capacity will be increasingly important and should also be addressed as part of a Management Plan as is required for the site. It is essential to continue with the de-mining work to ensure the safety of people and to allow appropriate access and understanding of the monuments in their setting.